There’s another way to make After the Deadline available on your blog. Now you can use it with comments thanks to the After the Deadline for Comments plugin by Otto42. You can see it in action on the world-famous ma.tt blog. If you have feedback on this plugin, there is a thread on the WPTavern.com forum. If you’re an IntenseDebate user, don’t forget that After the Deadline is available as an IntenseDebate plugin too. It works pretty seamlessly as well. Finally, the commercial (but GPL) AJAX Edit Comments plugin integrates After the Deadline too. So, if you’re looking for spelling and grammar checking for your blog comments, After the Deadline can help. If you just want this checking capability for yourself, we offer plugins for Google Chrome and Firefox as well. When After the Deadline started out, its greatest weakness was the lack of places one could use it. 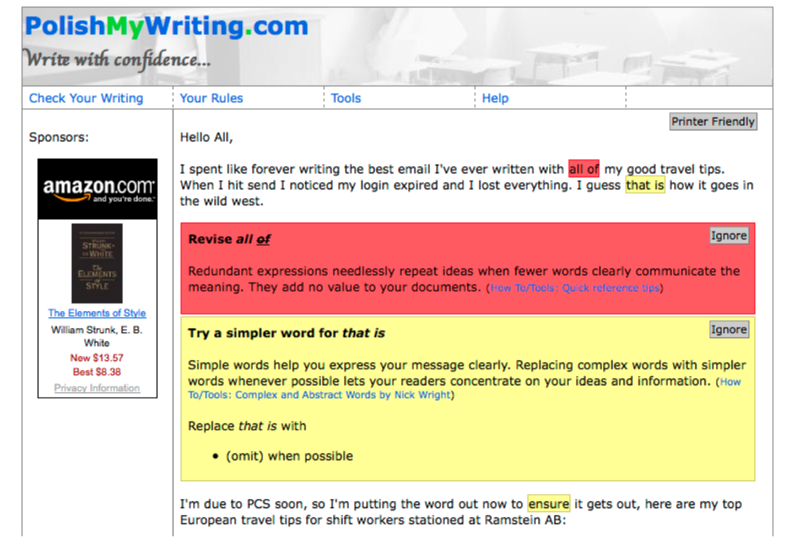 Originally it was available on PolishMyWriting.com, then WordPress and TinyMCE, and now many more applications. Making After the Deadline available in many places has allowed many of you to use it. After the Deadline isn’t the only proofreading game in town though. 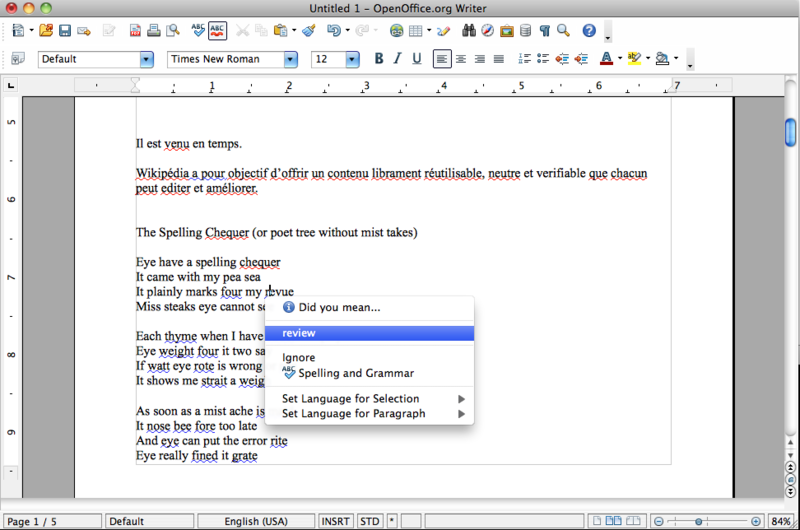 Language Tool, An Gramadóir, and CoGROO are among many existing projects to make proofreading technologies available under an open source license. The challenge for these tools is they can’t be used in many places. The three I mentioned are available for OpenOffice.org and maybe a few other places. So, imagine that you want to make your proofreading technology available in more places, what would you do? One solution: implement the After the Deadline protocol. After the Deadline is available for Firefox, Google Chrome, bbPress, WordPress, TinyMCE, jQuery, and even OpenOffice.org (beta). We have pretty solid extensions for each of these. Each of these extensions communicates with an After the Deadline server using a simple XML protocol. If your proofreading technology spoke the After the Deadline protocol, then in theory, you could point one of our many extensions to your software and voilà, you’ll have a full user-experience for your technology. The developer of Esperantilo, a grammar checker for Esperanto, realized this and modified AtD/Firefox to talk to his program when it’s running. The result? Speakers of Esperanto now have an option to check their Esperanto writing from Firefox. Right now it’s easy to configure AtD for WordPress.org, bbPress, TinyMCE, jQuery, and OpenOffice.org to talk to another server. That’s a lot of ways for users to use your proofreading technology. Artur, the developer of Esperantilo, had to use an older (non-SSL) version of AtD/Firefox to point it to his software. 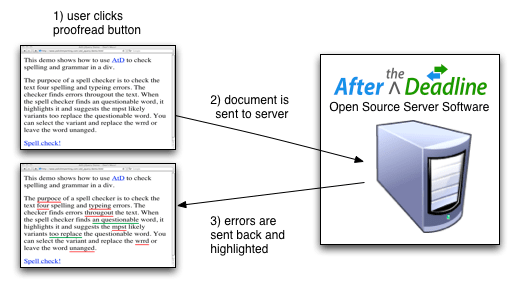 If other proofreading packages choose to support the After the Deadline protocol and API, I’m happy to add an option to After the Deadline for Firefox and Google Chrome to support custom end-points. If more developers implement the AtD protocol in their proofreading software, then users can benefit from using the best proofreading technology for their needs in many more applications. Wow, I almost missed it. On 1 Jun 09, I launched After the Deadline. The first review of After the Deadline (AtD) came from w-shadow.com. There were also discussions on CMSReport.com and Hacker News. It’s been an exciting year. On 21 Jul 09, I started with Automattic. Matt and I had worked out the deal several weeks earlier. We announced the acquisition of After the Deadline in Sept 09 and also made AtD available on WordPress.com. I remember I was a little nervous about going live on WordPress.com. AtD is written in my language Sleep. I’ve used Sleep for a lot of things but not for the back-end of a web-scale project before. I was afraid of a memory leak or a freak concurrency issue. Fortunately, neither of these issues came up. Shortly after that, we open sourced the After the Deadline service. This is something that will take time to have its impact, but make no mistake, it’s significant. Using statistics to provide better proofreading is nothing new. Researchers pursued the topic in the 90s and during the earlier part of the last decade. Production tools are starting to use statistical language models to provide smarter suggestions and even correct harder errors like misused homophones. Microsoft Word 2007 has a contextual spell checker that looks for misused words. Microsoft Research is developing ESL Assistant, a tool that uses a statistical language model to filter incorrect grammar suggestions. There are also new tools like Ginger and Ghotit that use statistical techniques to deliver smarter results for writers with learning disabilities. I believe cheap and powerful hardware, lots of available data, and persistent internet connectivity made these smarter, data driven, writing tools practical for production use. We’re riding the same wave of “now possible”. I’m excited about After the Deadline’s place in this period of change. After the Deadline is simultaneously a production system and a research system. The code is available for researchers and students to tinker with and learn from. Let’s not forget, this also means that you can run your own AtD server and add AtD to your application. Recently, this project produced its first academic paper. Sunday (6 Jun 10), I will present After the Deadline at the Workshop on Computational Linguistics and Writing taking place at the 2010 North American Association of Computational Linguistics Human Language Technologies Conference. After the Deadline went from one to five languages in the past year. We’ve released preliminary support for French, German, Portuguese, and Spanish. We offer contextual spell checking in these languages. 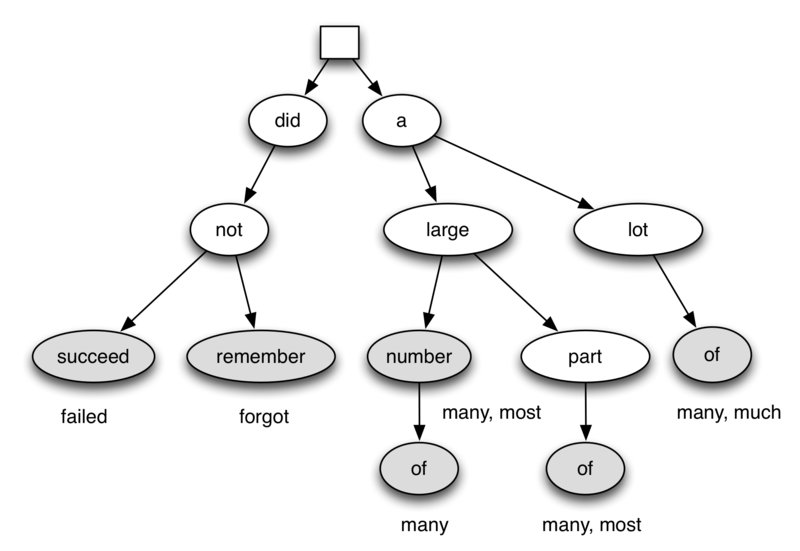 We also use our language model to make the Language Tool grammar checker smarter. There is still much work to be done to bring our misused word detection to more languages. At WordCamp NYC, someone approached me with “I love After the Deadline but I always forget to run it”. He suggested we add a feature to automatically proofread posts on submit. No good idea should get lost, so I posted this to the ideas page. Later, I received an email from Mohammad Jangda, who offered to implement this feature. I first made his patch live on WordPress.com. Without an announcement, 500 people were enabling it each day. Over time, auto-proofread doubled the use of After the Deadline on WordPress.com. This same feature has made it into our other platforms as well. Our wish is to see AtD help people write better in as many places as possible. We put a lot of effort into making high quality plugins, it’s nice when we get help. Gautam Gupta is a great example of such help. He created After the Deadline for bbPress. He and I release updates around the same time and he usually beats me to the punch. My favorite is when he announced AtD/bbPress with support for French, German, Portuguese, and Spanish before I had an updated WordPress plugin out the door. As I mentioned in the last paragraph, After the Deadline is now available in a lot more places. We have stable plugins for jQuery and TinyMCE. The AtD Core library has allowed us to reuse the protocol parsing and error highlighting logic in many projects. We now have After the Deadline for Firefox and Google Chrome. I’m amazed at how well these add-ons work. I didn’t believe they were possible. Mitcho Erlewine took on the initial challenge and worked with us to make After the Deadline for Firefox a reality. We continue to experiment with other applications too. Who knows where you might see AtD next. Last month, our AtD servers processed 3.5 million blog posts, emails, tweets, status updates, and who knows what else. That’s a lot of proofreading. Not bad for a first year. Last week, switched.com reviewed several grammar checkers to celebrate National Grammar Day. The tested text was interesting to me and it inspired this post. Its common for users to rely entirely on the in built proofreading capabilities of a word processor. Since the technology became standard in Microsofts Word in the 90’s countless cubicle dwellers and students have stopped carefully proofreading they’re own writing they have instead trust the automated spellcheck and grammar correcting features of their office product of choice to identify errors. We have carefully crafted this text to test the accuracy of these features, there are roughly 10 common grammatical mistakes in this paragraph. No matter good these tools perform there no replacement for carefully rereading you’re writing. I agree and I think it’s time people rethink their relationship with their spell checker. My friend Karen once told me a story about giving her husband feedback on a school paper. She noticed that he really liked semicolons. She confronted him on this and he said that Microsoft Word kept suggesting them and he kept accepting them. This is not a good situation. Many writers rely on their spell checker to a fault. They see their spell checker as a tool to verify that a document is correct and ready to go with no effort on their part. If you want to verify that a document is correct, you need to reread it and look for errors. A great technique is to read the document backwards. Purdue’s Online Writing Lab has more tips like this. If writers need to reread their documents, then what is the use of tools like After the Deadline? I look at After the Deadline as a tool that teaches users about writing. When asked what I do, I sometimes reply that I’m an English teacher with many thousands of students. No one gets the joke. It’s ok.
After the Deadline does a good job of finding its/it’s errors. It does not find all of them. I think this is OK. If a user checks their document and has a habit of misusing its/it’s, they’ll probably see a lot of errors. If this user is inquisitive, they may quick click explain. By doing this they’ll learn why the error is an error. By reading the feedback during the writing process, the lesson has the most potential to sink in. Feedback is most valuable when it’s immediate. After the Deadline makes you a better writer through immediate feedback.